Farrar, Straus and Giroux, 9780374271879, 432pp. When Julia Lambert, an art professor, settles into her idyllic Maine house for the summer, she plans to spend the time tending her fragile relationships with her father, a repressive neurosurgeon, and her gentle mother, who is descending into Alzheimer’s. But a shattering revelation intrudes: Julia’s son Jack has spiraled into heroin addiction. In an attempt to save him, Julia marshals help from her looseknit clan: elderly parents; remarried ex-husband; removed sister; and combative eldest son. Ultimately, heroin courses through the characters’ lives with an impersonal and devastating energy, sweeping the family into a world in which deceit, crime, and fear are part of daily life. In Cost, Robinson tackles addiction and explores its effects on the bonds of family, dazzling us with her hallmark subtlety and precision in evoking the emotional interiors of her characters. The result is a work in which the reader’s sense of discovery and compassion for every character remains unflagging to the end, even as the reader, like the characters, is caught up in Cost’s breathtaking pace. “Roxana Robinson is surely one of the most graceful stylists and psychologically perceptive writers working . . . Cost approaches the subject of drugs’ impact from an original and very significant angle. This book shows further the extent of Robinson’s insights into the whirl, the generational ironies at work, and desperate indulgences to which we turn in our confusion. 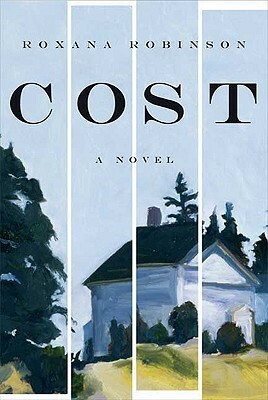 Cost is an important timely book that furthers insight into our preset fortunes and dilemmas."